9 new models were released in 1995, the most in any year so far. These 9 models were not mere duplicates or enhancements of previous years. On the contrary, a number of new parts, building concepts, and marketing techniques were introduced. 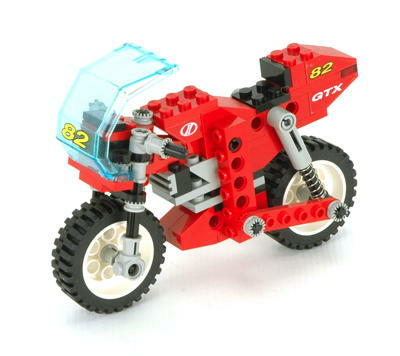 After the technological pinnacle of 8880, it is possible that LEGO® realized that some models were quite difficult for an average child to assemble and understand. The next few years would see a decline in the overall complexity of models, with a couple of notable exceptions. 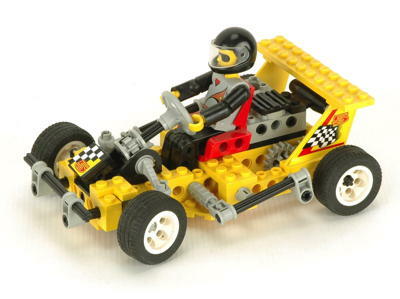 The first obvious change of 1995 was the way sets were numbered and marketed. From 1980-1994, most sets had followed one of two numbering conventions. 8000 series sets were Universal Sets, and 8800 series sets were single models (with alternates). Both of these series ended in 1994. In 1995 both the 8200 series and 8400 series were introduced, which would remain in use for a decade. The 8200 series was marketed under the moniker "Tech Play". These sets tended to be more play focused than technically focused. They tended to be smaller models with a limited number of features. Often considerable use of sticker sheets was made to enhance the look of the models. 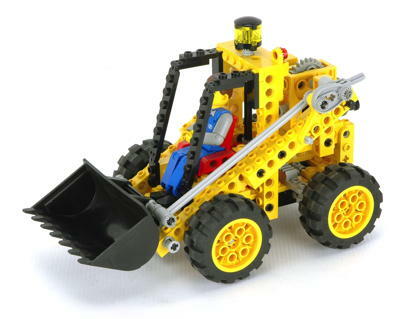 Additionally, a large percentage of Tech Play models came with Technic figures which had been quite rare prior to this time, appearing in only a handful of sets. 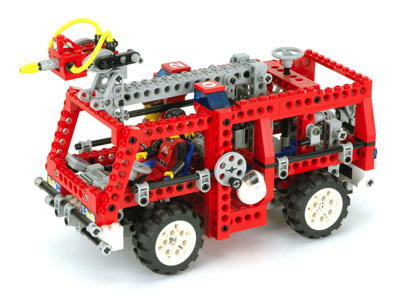 4 Tech Play models were released in 1995, 3 of them including Technic figures. The 8400 series was marketed under the moniker "Tech Build". These sets tended to be more complicated, have a greater number of functions, and have a larger part count. They rarely contained figures or stickers, but often concentrated more on modeling realism and functionality. Some very exceptional models would come out of this line. 4 Tech Build models were released in 1995. Finally, set 8485 is difficult to categorize. Like 8094, it used the Control Center as its hub. It was like a Universal Set in that it included full instructions for 3 full models, but was much more complicated than any other Universal Set, bore a different numbering scheme, and most importantly didn't actually say "Universal Set" anywhere on it. No matter what you call it, it was not only the best model of 1995 but one of the very best sets ever. 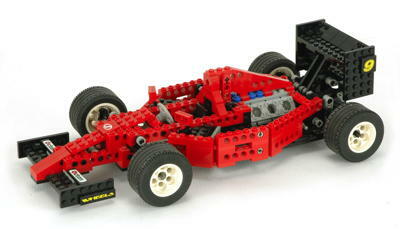 There were quite a number of new parts for 1995 including some new "on road" tires and some purpose built gearboxes. 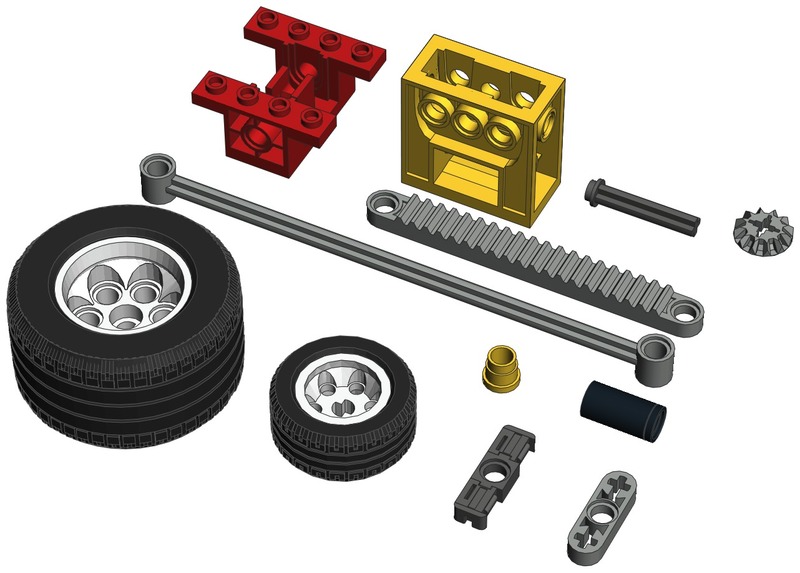 The gearboxes were used to make geared connections simpler to build, especially for the Tech Play models. There was also a new stopped axle, a new stronger bevel gear, a longer gear rack, a longer link, a liftarm, a pin connector, and a useful little handle that appeared only this year and then mysteriously disappeared. Two new sizes of wheels and tires were introduced which matched the general aspect ratio and tread pattern of the big 81.6 x 34 ZR from set 8880. The new mid sized tires are called 49.6 x 28 VR and the smallest are 30.4 x 14 VR. What is the difference between the title "VR" and "ZR"? I have no idea other than that this may be a speed rating. The previous rack gear had been a 1x4 unit which attached to the top of a plate using studs. The new 1x8 rack gear pictured was something different. Beside being longer, it also had holes at the end to which ball joint or axles could be attached. Additionally, there were no stud tubes on the bottom. This meant that it could still sit over a plate, but could also slide along the studs on that plate. This part became very common for decades and was later released in other lengths. This handy little part looks like a 3L axle, but has the additional feature of a stop collar and stud on one end. If inserted into the hole in a Technic beam, the stop collar drops into the counterbore on the beam and disappears. This leaves you with an exposed stud on one end and a rotatable axle which which will not pull out of the hole. This little part only existed in dark gray until 2010 and has been used many times in many models. The old standard 14 tooth bevel gear was replaced this year with a 12 tooth bevel gear. Beside the obvious difference in tooth count, the other difference is that the new bevel gear has a solid web behind the teeth which gives it considerable extra strength. 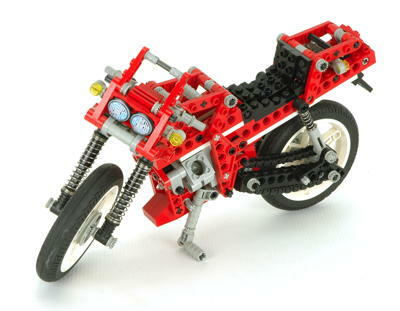 A 16L link (tie rod) was introduced to Technic. 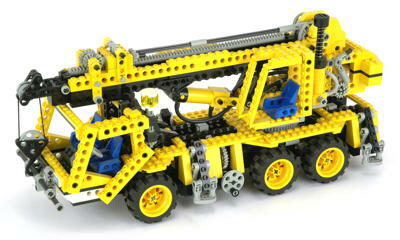 This long two-force member was only used in a single Technic model, 8235. 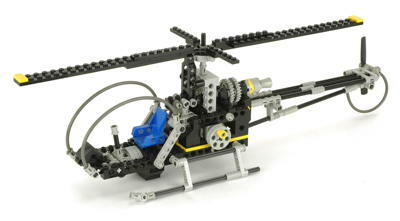 Many original Technic sets used a large pulley as a crank in combination with a pin as a handle. Later, it became more common to use the smaller pulley with a half pin. The disadvantage to this is that the 1/2 pin does not rotate in the hole and therefore has to rotate in your fingers as you turn the crank. This was solved in 1995 with a little round handle that snapped over the pin and rotated allowing faster, easier cranking. For some reason, this part only existed in 1995 and was never used again. The disappearance of this part is a mystery since I see no obvious flaw in it, but it is quite rare as a result of its short life. A round pin joiner was introduced. This part is the length of a pin and can lock a pin inserted from each end due to a circumferential groove in the center halfway along the length. It can either be used to extend the length of a pin or can be slid over an axle as a spacer or decorative element. A 1x3 liftarm was introduced. This very important part was a significant harbinger of the future. 6 years earlier in 1989 the first liftarm was introduced (1x4). This 1x3 liftarm also has an axle slot at either end and a hole in the center. Unlike the earlier part, it is not 1 stud thick at one end but remains 1/2 stud thick along the entire length. Many, many more liftarms would be introduced in the future and in fact would eventually become the primary Technic construction part almost entirely replacing traditional beams. A new kind of flex system end connector was introduced. The previous connector had to be pushed onto the cable from the side. The bending stress from this often fractured the cable. With the new connector, the cable is inserted and then a flap is snapped closed over the cable ferrule which prevents it from pulling out. This improved method made the flex system much more durable. In addition to the standard new end connector, there was also an end to end connector which allowed two cables to be connected with an axle hole in the center. There were also two new gearboxes introduced which made the assembly of certain gear combinations simpler for younger children. At least one of the two gearboxes were used in the majority of the Tech Play models. 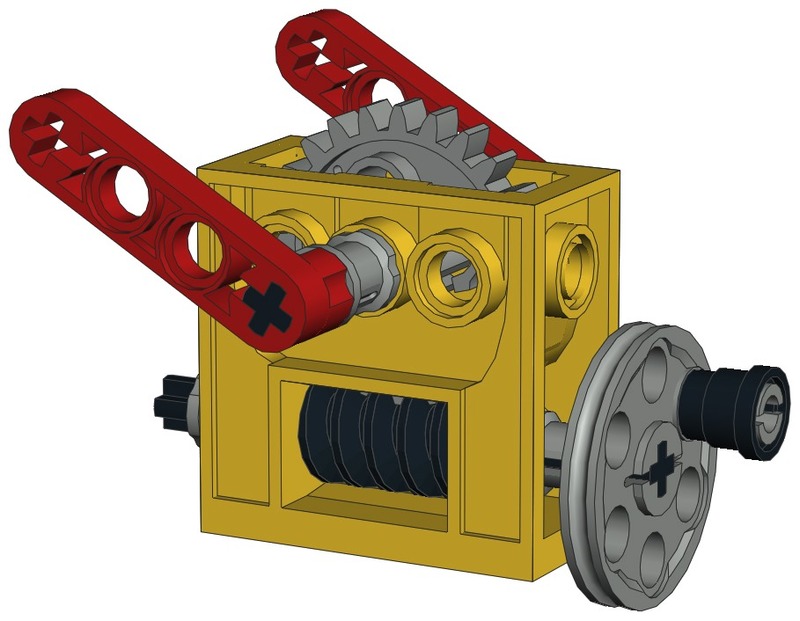 The worm gearbox (shown in yellow in the animation) supported a 24 tooth spur gear and a worm gear along with their associated perpendicular axles. With the worm axle used as an input, this gearbox allowed a 24:1 reduction and could be integrated into models using the studs on top and bottom or the holes on the sides. 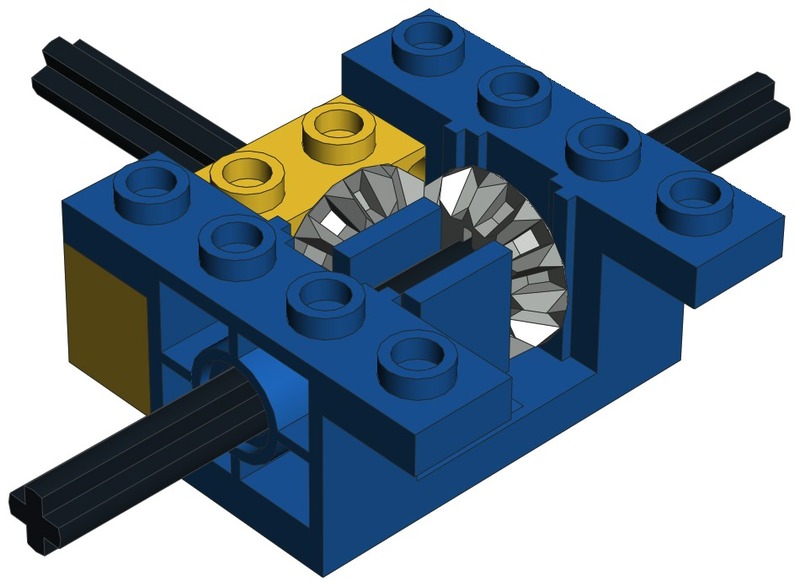 The bevel gearbox (shown in white in the animation) allowed a pair of perpendicular bevel gears to be mated in either a horizontal or vertical plane and provided support for the axles.